Try not to stomp on the iPad. 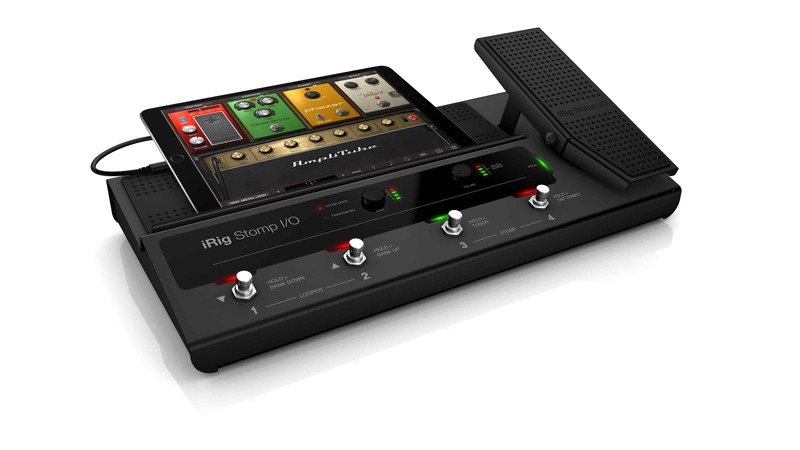 The new iRig Stomp I/O is a one-stop box for using your iPhone, iPad or even Mac with a musical instrument. You place it on the floor, drop your iDevice onto the provided shelf space, connect it to an amplifier, mixer or speakers, and you’re away. 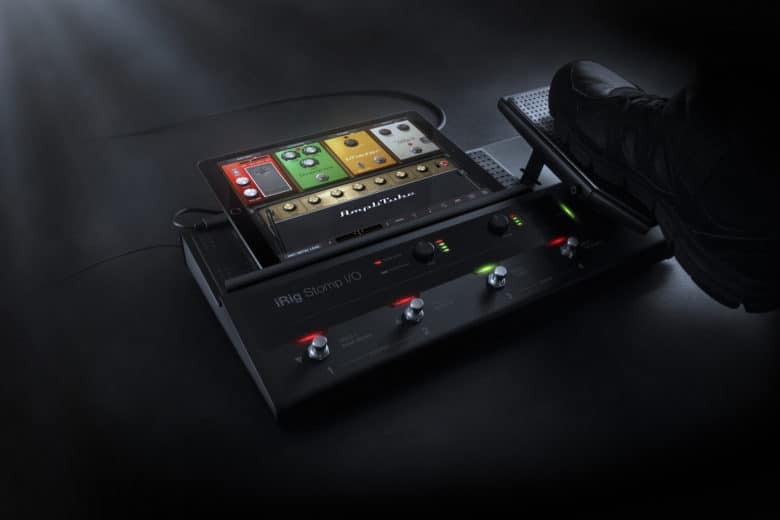 The idea is that you can hook up a guitar or microphone and use it with any of the music apps on your device, and control it all with foot pedals. There’s nothing really new in the Stomp I/O. What’s unique is that it’s all gathered into one floor-mounted pedalboard. 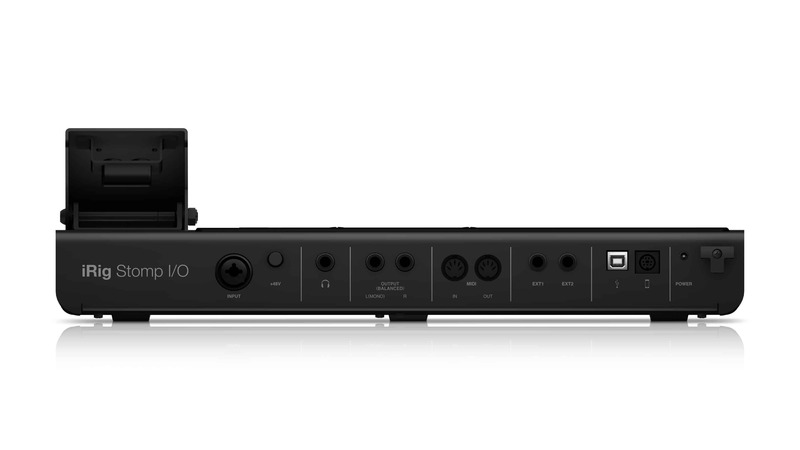 The unit combines a USB audio interface for connecting instruments to your iPad, along with a set of foot switches for toggling effects, or controlling apps while you stand and play. There’s also a built-in expression pedal, that allows you to control parameters with your feet. I give that vulnerable iPad five minutes before someone spills beer on it. For instance, a guitar player could hook up the Stomp I/O between guitar and amp, then use any of the many guitar effects apps available for iOS. Their iPhone or iPad then becomes the brain of the unit, with the Stomp I/O as a foot-operated remote. The Stomp I/O can also function as a standalone MIDI controller. MIDI is the language music apps and devices use to talk to each other, and the Stomp I/O can use its switches to control any MIDI device, without having to plug it into a computer first. The Stomp I/O has plenty of connections, but it has one annoying design aspect common to most iRig devices: a proprietary iOS cable. Instead of a standard USB port that could connect to an iPhone using a standard Lighting cable, you must use a special cable with a mini-DIN connection. One is supplied with the kit, but it’s only 2 feet long. This makes the entire Stomp I/O unsuitable for use onstage, because the 2-foot cable means you must leave your iDevice down on the Stomp I/O’s shelf, guaranteeing it’ll get beer spilled on it, or worse. Lots of connections, both good and bad. Thankfully, there is a USB-A port for hooking it up to a Mac or PC, so you should be able to use that for an iDevice with the right adapters, and keep the iPad up out of harm’s way (where you can reach it with your hands to adjust settings in the apps). Still, it’s an ingenious idea, and much better executed than previous efforts to do something similar. If you’re in the market for using your iOS device for live music, and you have the money to spend, then this has everything you’ll need.